A New England Camping Vacation offers an exceptional way to visit New England. New England Camping and RV sites may be found in some absolutely beautiful locations. Today’s modern campsites can include amenities like easy RV hook-ups, cable TV, electricity, swimming pools, playgrounds and recreational activities. 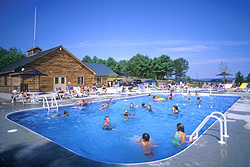 In Vermont find an RV Park that is a family playground with all the amenities. KOA Camping is first-class in Naples, Maine. We love to Camp New England and when you visit our suggested New England Campgrounds you will understand why. Ask us about RV sites and campgrounds or feature your New England Campground or RV Park, contact us. There’s nothing more spectacular that camping in the lush summer forests of the Vermont Green Mountains. Explore the Vermont Camping Guide to find that perfect camping adventure destination in the Green Mountain state. At times, there can be nothing better than being alone with nature. Of course, this all depends on where you have set your tent up. From the more northern areas of the Great North Woods region, to the shores of Lake Winnipesaukee, and even further south to the campgrounds in the Seacoast region that utilize the beautiful setting of the Atlantic Ocean; you can never fail with camping in the great state of New Hampshire. Stay at a sensational New Hampshire campground. Maine is an ideal place for your outdoor adventure. Maine Camping is a favorite of many seeking lakes, mountains, and oceanside campgrounds and RV Parks. Some Maine Campgrounds are open all year, but as the temperatures warm, Maine campgrounds come to life. Maine offers many fantastic privately owned and operated family campgrounds, campsites and RV parks. Whether your ready to pitch a tent by a Maine lake or haul the RV to a Maine oceanfront camp site, Maine is made for camping – which is why so many people visit Maine to go camping. Variety, affordability and congeniality is all part of Maine camping. Whether you are looking for your first camping experience, or you are a pro, Massachusetts offers a wide variety of camping locations throughout all regions for the entire family. Camping in the Berkshires of Western Massachusetts is an annual event for many campers and RV enthusiasts – one visit and you will understand why. Find more info about Massachusetts in MA Living. With miles of ocean frontage and hundreds of acres of wilderness – Connecticut Camping is as varied as the seasons here in the Nutmeg state. Find a beautiful tree grove, a former native American hunting ground now a Connecticut state park, or camp along the shores of the Atlantic Ocean or a sparkling Connecticut lake. Find the perfect spot for your Connecticut camping adventure this summer. Browse CT Living more information. Some of Rhode Island’s most popular campgrounds include George Washington Campground and Whippoorwill Hill Family in Northern Rhode Island, Worden Pond Family Campground and Burlingame State Park in Southern Rhode Island, Old Embers Campground and Colwell’s Family Campground in Central Rhode Island. RI offers a wide range of camping and RV sites – many with full services and amenities. When thinking about a New England Camping vacation, what images come to mind? Roaring campfires, gooey s’mores and pitching a tent are things generally associated with this family-oriented activity. But for many, the definition of “camping” has undergone a radical change. New England now offers Luxury campground and RV resorts – a new trend in family camping vacations. Today’s camping is changing the way people sleep under the stars. Boasting heated swimming pools, golf courses, finely appointed cabins, live entertainment, and in some cases, exclusive beach access – luxury, full service camping resorts make it possible to have a great time, without even leaving the campground! Amenities at these Northeast camping resorts are focused on making your stay more convenient as well as fun. Large general stores stocked with supplies and souvenirs are common. So is high-speed internet access and cable television hookups. Whether camping in a tent or a 36′ luxury RV – this new breed of camping is perfect for the family vacation, or a relaxing getaway for two.